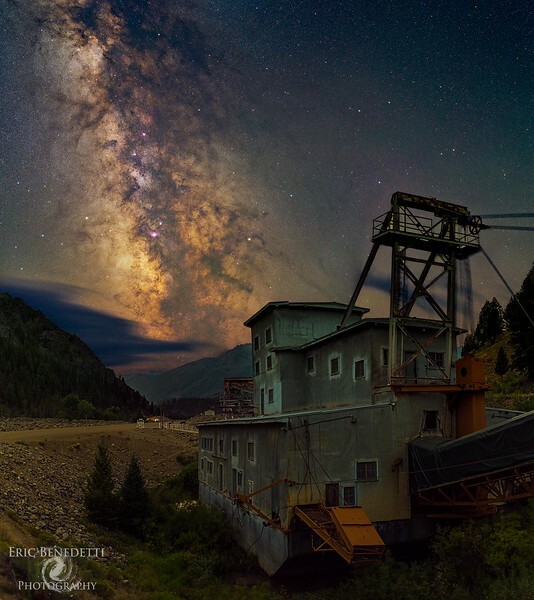 This is a shot taken at the Yankee Fork Gold Dredge, another one I had planned in spring 2016 but never got around to finishing due to weather/time/fires/etc. The dredge is a great piece of local history, assembled in the mid-1900's it weighs nearly 1,000 tons. It dredged up to 7,000 cubic yards of material a day and over the course of 12 years, from 1940 to 1952 it operated on the Yankee Fork. Altogether it mined over a million dollars in gold and silver from the creek. 8 shots for this one, 4 for the sky and 4 for the foreground, sky shots were 3 minutes at ISO 800 and f2.8 while foreground shots were 3 minutes at f1.4 and ISO 800. All shots taken with my Nikon D800E and Sigma Art 50mm on a Sky Watcher Star Adventurer Tracking Mount.